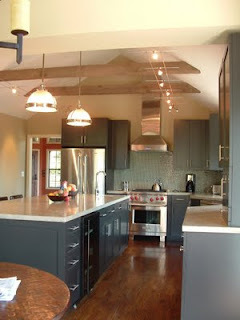 It can be a challenge to light a kitchen that has a pitched ceiling. I want to accent what is great about the architecture and not have it overpower the other elements. In this space I ran the cable system above and perpendicular to the antique beams to be more subtle in constrast to the oversized pendants.